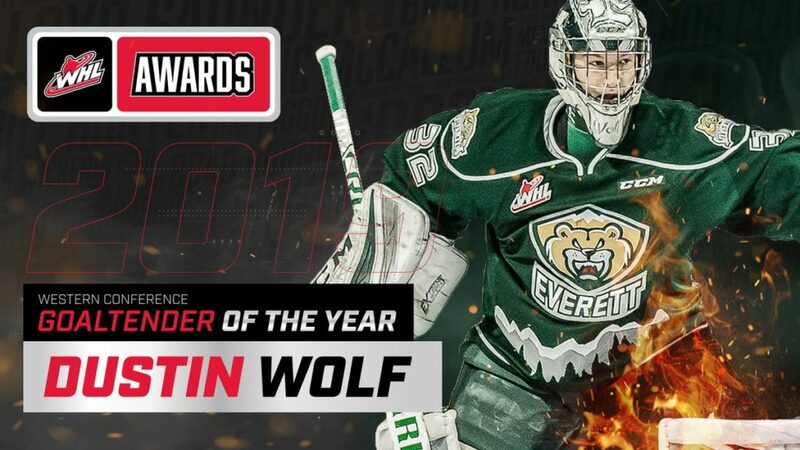 EVERETT, Wash. – The Everett Silvertips (@WHLSilvertips), seven-time U.S. Division champion of the Western Hockey League, announced today in conjunction with the WHL that goaltender Dustin Wolf has been named WHL Western Conference Goaltender of the Year. Wolf and forward Connor Dewar have also been named to the WHL Western Conference First All-Star Team. Wolf, 17, is eligible for the 2019 NHL Entry Draft and recently completed his regular season as the WHL leader in wins (41), save percentage (.936), goals-against-average (1.69), minutes (3,615), was second in shutouts (7), and fourth in saves (1,493), while setting a new Silvertips single season record in wins, posting the second highest save percentage in the franchise’s single season history, the second lowest goals-against-average in franchise history – and fourth lowest in WHL history. Wolf, along with Eastern Conference winner (Ian Scott, Prince Albert), are nominees for the Del Wilson Memorial Trophy to be awarded on May 1 at the WHL Awards luncheon in Red Deer, Alberta. The Tustin, Calif. native has been named Vaughn CHL Goaltender of the Week three times and Eli Wilson Goaltending WHL Goaltender of the Week five times this season. He recorded 30 saves or more in a game, 12 times in the regular season and earned a season high 43 saves on Dec. 8 in a 2-1 victory over the Seattle Thunderbirds in Kent, Wash. On 31 occasions this season, Wolf allowed one goal or less in a game. Wolf is 54-21-2-2 over 81 regular season games in his WHL career with the Silvertips, along with a .934 save percentage, 1.83 goals-against-average, and 11 shutouts. In Silvertips all-time history, Wolf is fifth in wins, fourth in shutouts, and the current all-time leader in save percentage and goals-against-average (minimum 20 games). Before the start of the season, Wolf suited up for Team USA at the Hlinka Gretzky Cup in Edmonton and participated in the USA Hockey All-American Prospects Game, Sept. 19 in Minnesota which showcased the top U.S.-born prospects eligible for the 2019 NHL Entry Draft. His 1.83 career goals-against-average currently ranks second lowest in league history (minimum of 60 games played) and last Saturday was named recipient of the Silvertips Most Dedicated Player, Community Relations, Scholastic Player of the Year, and F.I.E.R.C.E. Predator awards. The Silvertips open the 2019 WHL Playoffs, presented by Mountain Pacific Bank, with Game 1 of the first round on Friday, Mar. 22 against the Tri-City Americans, 7:35 p.m. at A.O.T.W. Arena in downtown Everett. Silvertips “Game A + B” playoff packs are on sale now at www.everettsilvertips.com/tickets, with the first round scheduled to play in downtown Everett starting on Friday and Saturday, Mar. 22-23.